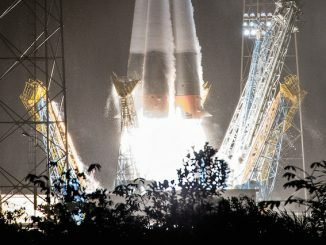 Launched Wednesday from the Baikonur Cosmodrome in Kazakhstan, the Soyuz TMA-18M ferry craft glided to a smooth docking at the station’s upper Poisk module at 3:39 a.m. EDT (GMT-4) to close out a trouble-free rendezvous. Moments later, hooks and latches engaged to pulled the Soyuz snugly into place. Spacecraft commander Sergey Volkov, European Space Agency flight engineer Andreas Mogensen and Kazakh cosmonaut Aidyn Aimbetov then stood by for lengthy leak checks to verify a tight seal before opening hatches and floating into the space station at 6:15 a.m.
Welcoming them aboard with hugs and broad smiles were Expedition 44 commander Gennady Padalka and his two Soyuz TMA-16M crewmates, Scott Kelly and Mikhail Kornienko, and Soyuz TMA-17 crew members Oleg Kononenko, Japanese astronaut Kimiya Yui and NASA astronaut Kjell Lindgren. Crowding into the Zvezda command module, Volkov and his crewmates briefly chatted with family members and senior space officials who were gathered in the Russian mission control center near Moscow. “We’re doing well, everybody is doing well, we’re ready for work,” Volkov said. Mogensen, the first Dane to fly in space, said it took him a day or so to get used to weightlessness. 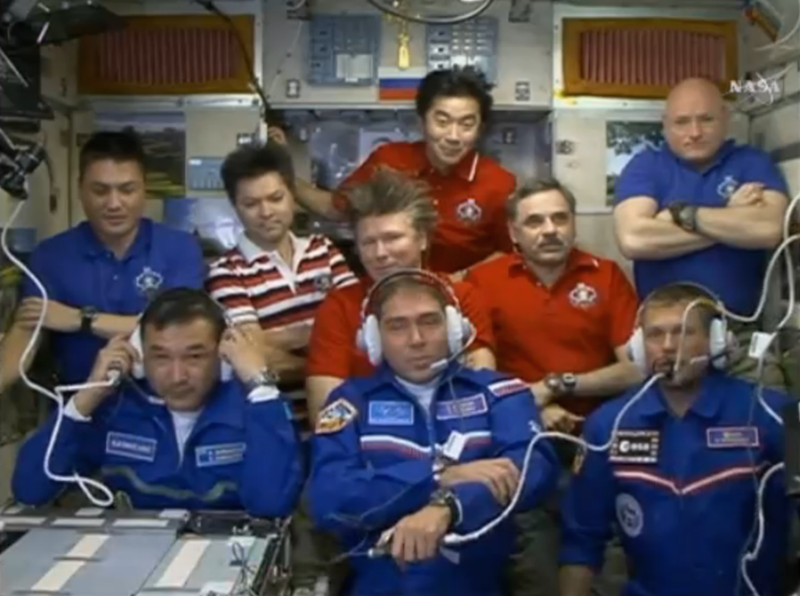 With the arrival of Volkov and his crewmates, the space station is hosting nine crew members for the first time since November 2013 when the Russians facilitated the delivery of an Olympic torch to herald the Winter Games in Sochi. This time around, the crew overlap was required to deliver a fresh Soyuz to the space station that will be needed in March when Kelly and Kornienko return to Earth after nearly a year aboard the station. Padalka, Kelly and Kornienko were launched to the outpost on March 27 but their Soyuz, like all Russian ferry craft, is only certified for 200 days in orbit. As a result, Padalka will return to Earth aboard the TMA-16M spacecraft on Sept. 11, along with Mogensen and Aimbetov. Volkov will remain behind in orbit, returning to Earth in early March with Kelly and Kornienko aboard the TMA-18M spacecraft. Kononenko, Lindgren and Yui are scheduled to come home in December aboard the same Soyuz TMA-17M spacecraft that carried them into orbit July 22. 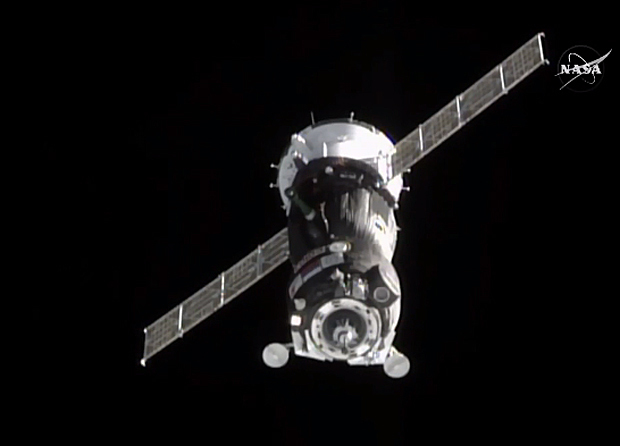 For Mogensen and Aimbetov, the delivery of a fresh Soyuz provided a rare opportunity for a short-duration visit to the station. Mogensen plans to carry out a busy schedule of experiments as part of a commercial contract between ESA and the Russian federal space agency. Aimbetov was added to the TMA-18M crew to replace singer and would-be space tourist Sarah Brightman, who withdrew from training earlier this year. 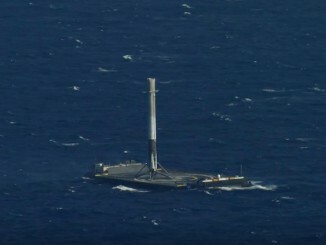 Aimbetov is the third Kazakh to fly in space. 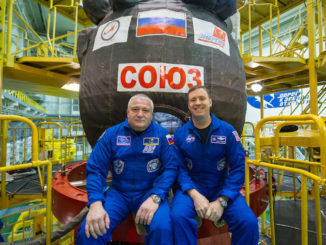 One early item on the crew’s agenda is to move customized seat liners for Mogensen and Aimbetov into the TMA-16M spacecraft and to move the seat liners for Kelly and Kornienko into the TMA-18M vehicle. The seat liners help cushion the shock of landing. Once that work is done, Padalka will hand over command of the space station to Kelly in a brief ceremony Saturday, marking the conclusion of Expedition 44. A joint crew news conference with all nine station fliers is planned for Tuesday.